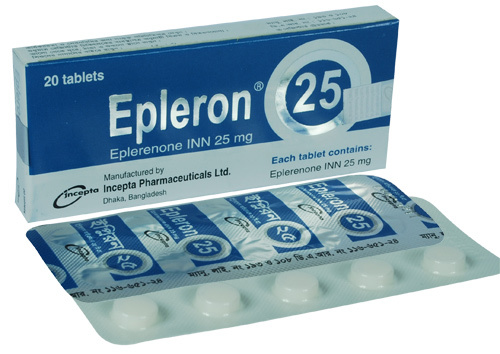 Epleron 25: Each tablet contains Eplerenone INN 25 mg.
Eplerenone is a blocker of aldosterone binding at the mineralocorticoid receptor. Eplerenone binds to the mineralocorticoid receptor and blocks the binding of aldosterone, a component of the renin-angiotensin-aldosterone-system (RAAS). Aldosterone synthesis, which occurs primarily in the adrenal gland, is modulated by multiple factors, including angiotensin II and non-RAAS mediators such as adrenocorticotropic hormone and potassium.Aldosterone binds to mineralocorticoid receptors in both epithelial (e.g. kidney) and nonepithelial (e.g. heart, blood vessels, and brain) tissues and increases blood pressure through induction of sodium reabsorption and possibly other mechanisms. Eplerenone has been shown to produce sustained increases in plasma renin and serum aldosterone, consistent with inhibition of the negative regulatory feedback of aldosterone on renin secretion. The resulting increased plasma renin activity and aldosterone circulating levels do not overcome the effects of Eplerenone. The recommended dose of Eplerenone is 50 mg once daily. Treatment should be initiated at 25 mg once daily and titrated to the target dose of 50 mg once daily preferably within 4 weeks as tolerated by the patient. Eplerenone may be administered with or without food. Eplerenone may be used alone or in combination with other antihypertensive agents. The recommended starting dose of Eplerenone is 50 mg administered once daily. For patients with an inadequate blood pressure response to 50 mg once daily the dosage of Eplerenone should be increased to 50 mg twice daily. Higher dosages of Eplerenone are not recommended either because they have no greater effect on blood pressure than 100 mg or because they are associated with an increased risk of hyperkalemia. Headache, dizziness, diarrhea, stomach pain, nausea, cough or flu-like symptoms may occur. Symptoms of a serious allergic reaction like: rash, itching, swelling, severe dizziness, trouble breathing can occur. Eplerenone should be used with caution in hyperkalemia, severe kidney disease, diabetic patients with Congestive Heart Failure after an acute Myocardial Infarction including those with proteinuria. potential risk to the fetus. Nursing Mothers: The concentration of Eplerenone in human breast milk after oral administration is unknown. Because many drugs are excreted in human milk and because of the unknown potential for adverse effects on the nursing infant, a decision should be made whether to discontinue nursing or discontinue the drug, taking into account the importance of the drug to the mother.